Welcome to another Becoming A Modern Man! I have been meaning to build some decks using the new Shadows over Innistrad cards but have had a few difficulties getting to it. I also continue to have problems with my laptop so this article is going to be a little different. This article is going to focus on the building process as unfortunately my video making ability has been severely hampered. Hopefully I'll be dealing with this issue shortly. Prized Amalgam is card I was excited about after seeing it in the Shadows over Innistrad spoiler. Amalgam is an exciting card that you can get onto the battlefield from the graveyard without casting and there are a number of cards that can help activate its ability in Modern. 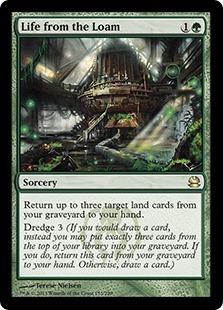 Obviously we want to fill our graveyard as rapidly as possible and Dredge is a great mechanic for this purpose. Dredge is an interesting deck in Modern but one that hasn't quite reached a level to be truly successful. Prized Amalgam seemed like a card that Dredge decks would be very interested in. 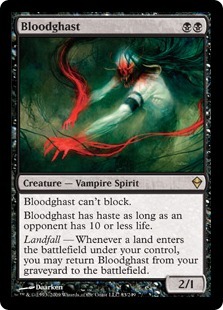 The Amalgam has great synergy with Bloodghast, which is already a Dredge staple, and as it is a Zombie it can also work well with Gravecrawler. 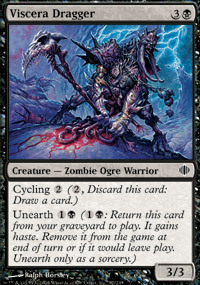 Gravecrawler is a powerful recurring threat that doesn't usually make it into Dredge decks because of the Zombie requirement. Knowing these were the three cards I wanted to build the deck around the difficulty then is working out the cards and the manabase to support them. This was a recently successful decklist that Jason Chung managed to Top 8 with during Eldrazi Winter. I tested this deck out after the tournament and so it's probably shaped my knowledge of the Dredge deck towards this type of build. As such my decklist probably more resembles this style of decklist. 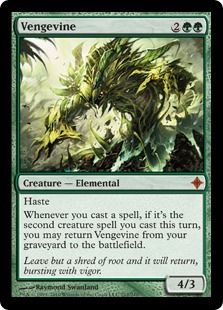 This is an example of a Dredgevine deck. These decks are more creature heavy in order to get Vengevine into play. As such the deck is focused on quickly milling or Dredging cards into the graveyard and then casting multiple creatures in a turn. Gravecrawler works here as you 'cast' it from your graveyard unlike other cards. It may be that this style would work better for Prized Amalgam but I will have to investigate this further. This is the list I am currently testing out after working through a few ideas. It is by no means the finished article but it's a decent starting point. Below in the Deck Tech section I want to talk about why I chose some of the cards in the list. I also want to talk about what I think has worked and what hasn't and what changes I would consider. Obviously I welcome any feedback you may have. One of the things that I hadn't really picked up on when reading Prized Amalgam until I started playing with it is the slightly awkward wording/timing of its ability. Amalgam's ability does not immediately return it to the battlefield, instead it returns 'at the beginning of your next end step'. On your turn this isn't generally a problem but if you are looking to return a creature to the battlefield on your opponent's turn, e.g. cracking a fetchland to return a Bloodghast or using Stitchwing Skaab's ability, you need to make sure you do it at the end of your opponent's second main phase and not 'at end of turn' like you normally would. Bloodghast is an easy auto-include. It returns from the graveyard very easily and is one of the best ways in Modern to get Prized Amalgam into play from the graveyard. If we could run more copies of Bloodghast we would. 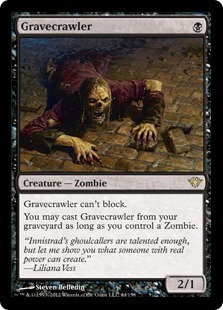 Gravecrawler seemed like a solid combination with Prized Amalgam and gives us a great number of cheap and powerful threats from our graveyard. 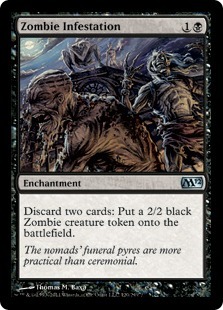 The problem is that Gravecrawler requires us to run a decent number of Zombies to ensure we can cast it from the graveyard with some sort of consistency. Prized Amalgam, although it is a Zombie, doesn't really help in that regard as we are wanting to cast Gravecrawler to get Prized Amalgam out of the graveyard not the other way around. There are a number of options when looking for a solution to this problem. My solution to this issue was running Stitchwing Skaab and Zombie Infestation. Stitchwing Skaab is another creature from Shadows over Innistrad. At first blush it's nearly perfect for our deck. 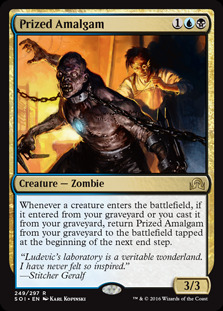 It's a Zombie so works well with Gravecrawler and it's able to return from the graveyard to work with Prized Amalgam. Additionally, it's a solid discard outlet which the deck likes. My experience with playing with Stitchwing Skaab though has not been fantastic. One of the awkward things about the card is that although you want to use it as a discard outlet if you draw it you have to find another discard outlet to put it in the graveyard. It also conflicts somewhat with Zombie Infestation as you aren't going to have enough cards to use both. On the positive side a 3/1 flyer is a powerful threat, particularly if you can get it out early. Flying over a ground stall is also a positive dimension to Skaab. I only wish this Imp was a Zombie as it would have great synergy. This 1-of was filling up some space in the deck and is a bit of a concession to the lack of removal in the deck. This probably shouldn't be here or maybe it should just be another Grave-Troll. 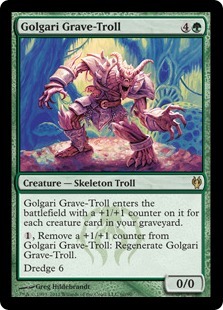 For maximum Dredge the Grave-Troll is very good. A lot of Dredge decks only run 1 or 2 copies though. 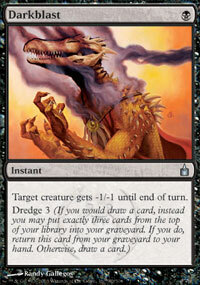 I think mainly because as you are unlikely to ever cast it you need to find a way to discard it again post-Dredge. I could see increasing the number of Grave-Trolls as sometimes we do just want to Dredge as much and as fast as possible. I am certainly willing to try running more Grave-Trolls but I don't currently own more than the 1 copy. Pharaoh is a piece of tech I picked up from Jason Chung's deck. The lack of removal in the deck is a problem and Pharaoh goes some way to helping that situation. Zombie Infestation is a very powerful enchantment. Discard outlets are important for the deck as basically we want the vast majority of the cards in our deck in the graveyard rather than in our hand. Infestation is a repeatable discard effect that also provides a tangible board presence that can be pretty overwhelming. It also has a strong interaction with Life from the Loam, turning those lands into 2/2 Zombies. The additional bonus in this deck is that as you are producing Zombie tokens the Zombie can allow you to recast Gravecrawler from the graveyard. Loam is an exceptional Dredge card. It helps Dredge cards into our graveyard and puts lands back into our hand. Stocking up your hand also works really well with Zombie Infestation. It also has some strong interactions with cards like Ghost Quarter and Bloodghast. I'm not really sold on Darkblast. When testing out Jason Chung's list it worked quite well but I don't think the metagame is quite in that place anymore. Certainly when it has no targets from your opponent's side it's pretty miserable. Darkblast tends to range from being awesome to terrible depending on your matchup which is quite irritating. It does help a little on the removal end of things though. I originally tried making this deck Black, Blue and Green to ease the pressure on our manabase. Instead of Faithless Looting I was running Thought Scour to dump cards into the graveyard. However, overall it just didn't work out and I found that Looting was worth stretching the manabase for. Looting does a lot of things we want - it digs us deeper into our deck and it allows us to pitch cards from our hand into the graveyard. It also has flashback so if we Dredge a copy into the graveyard we can still use it. Too good to pass up on in my experience. I'm not expert on building manabases but as I advised before looking at other successful decklist is a strong start. As I mentioned I did try a 3 colour manabase but moved back into red for Faithless Looting. 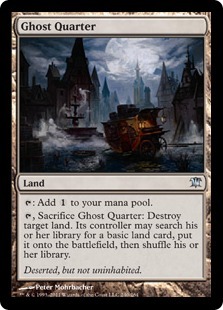 Ghost Quarter is the most interesting card in the manabase. It works really well with Life from the Loam as a way of disrupting your opponent's manabase. 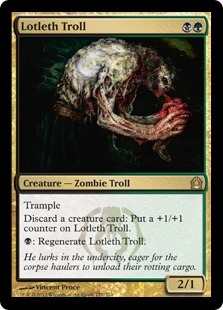 Lotleth Troll is a card I've only just stumbled upon. I feel like it could fix a lot of the problems I am currently having with the deck. It's a cheap discard outlet for our creatures and it's a Zombie. I will need to do some testing but I'm initially positive about this card. I think it could take some slots from the Stitchwing Skaab's and maybe the Zombie Infestations. The only problem is that it doesn't work particularly well with the Dredge spells as once you're Dredging the spell back you will not be drawing any more creature cards. That said if we moved to running more Grave-Trolls maybe we wouldn't have such a problem with Dredge spells. 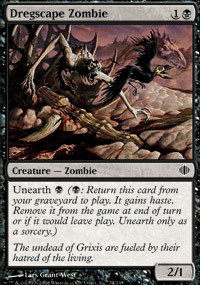 The Unearth mechanic also works very well with Prized Amalgam and better yet a few of them are Zombies. The fact that they are one-shots and cost mana to get onto the battlefield are marks against but they provide an interesting option to explore. Cycling Viscera Dragger to Dredge back another card from your graveyard is a nice interaction. I hadn't considered running Angler in a Dredge deck, however, as a large Zombie that can be cast cheaply using cards from the graveyard it does fit. I could not find any decks using Prized Amalgam when I started testing but now some decks are showing up online. Let's take a look another player's takes on building a Prized Amalgam deck. This is an exciting decklist and one I really want to try. Insolent Neonate is another interesting addition from Shadows over Innistrad addition. 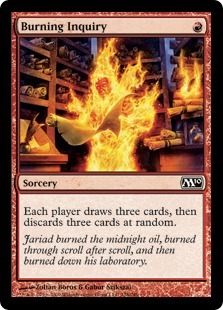 It's a cheap beater, discard outlet and a way to get an additional Dredge which seems very strong. I enjoyed looking the challenge of trying to build around Prized Amalgam. I hope this article discussed some of the options for the card and Dredge decks more generally. I'm not sure Prized Amalgam so far is enough to push Dredge decks power level to far above what it already was but it is an interesting option. I again apologise that I have no video content for this article but hopefully I will be able to get back to that soon. If you have any of your own brews or feedback to give please let me know in the comments.